These statues are notable for having a female subject. The Motherland Calls statue located in Volgograd, Russia. Statues are a kind of sculpture of a human or animal figure. They are three-dimensional, carved, and modeled image of a person or animal. The images are made of stone, wood, plaster, or metal. The statues are usually life-size or larger. Amongst the tallest statues of women in the world are The Motherland Calls, Virgin de le Paz, and Statue of Liberty. 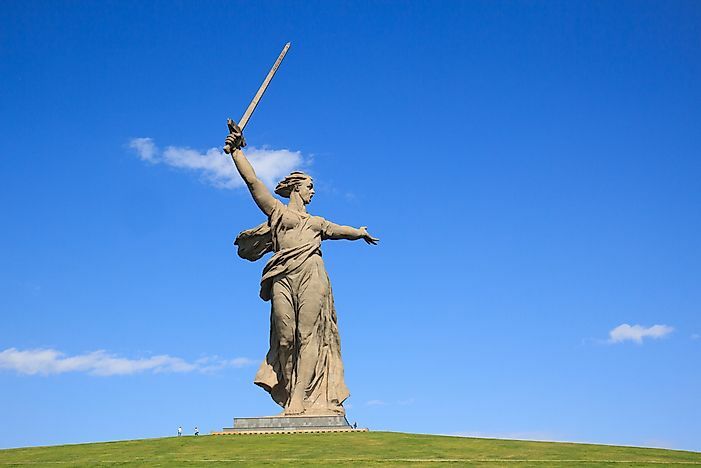 The Motherland Calls statue is the tallest statue of a woman in the world and the tallest statue in Europe. It is located in Mamayev Kurgan, Russia. Its height is 85 m whereby the woman is 52 m tall and the sword is 33 m tall. The Motherland Calls statue was designed by a sculptor named Yevgeny Vuchetich. It was built as a way of commemorating the Battle of Stalingrad which was fought during World War II. The Motherland Calls statue portrays a woman holding a sword in her right hand while the left hand seems to be making a calling gesture. It was inspired by the Winged Victory of Smoothrace which is an Ancient Greek sculpture. Virgen de la Paz is a 47 m tall monument with the portrait of Mary, the mother of Jesus. The name is translated Virgin of Peace in English. The Virgen de la Paz is located in Trujillo, Venezuela and is among the tallest monuments in Latin America. It is about 1700 m above sea level. Virgen de la Paz was designed by Manuel de le Fuente and unveiled to the public in 1983. It continues to be a major tourist attraction site and is the perfect spot to behold the panoramic view of the Trujillo state. The Statue of Liberty was built in the New York Harbor in the New York City, US. The 46 m tall statue was a gift from the French to the people of the United States of America. It was designed by Frèdèric Auguste Bartholdi and then built by Gustave Eiffel. It is the third tallest statue of a woman in the world. The woman is a symbol of a Roman goddess who is holding a torch above her head. In her left arm is a tablet with the inscription of the date of the US Declaration of Independence. The Statue of Liberty is an icon of freedom to the Americans. The Mazu of Tianjin is another statue which represents a Chinese sea goddess known as Mazu. After her death, she became the patron of seafarers who believed that she was watching over them from the heaven such as figures like Guanyin and the Virgin Mary do. The statue is 42 m tall and is located in Kinmen Matsu Park, Tianjin, China. Most of the statues act as tourist attraction sites. In fact some of them like the Statue of Liberty have become United Nations World Heritage sites because they have preserved the culture of nations for many years. The Statue of Liberty has remained a symbol of freedom for the people of US. Most women statues are of women who are believed to be granting protection to the inhabitants of the city in which the statue was built.